The western part of Canada is where our majestic mountains lie. And within those mountain ranges are several National Parks. 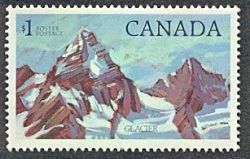 This series of stamps from from 1979 to 1986. Nice to see Banff here. 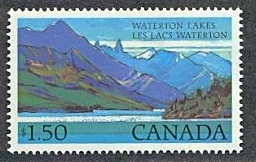 The stamps don't quite do justice to seeing that intense blue of the water there. I wish we had such mountains in Ontario. I've seen the bottom two before, but I really like the one from the Glacier National Park. yes, that one shows off the ragged mountains more, doesn't it? Mountains and water, always a winning combination. all we need here is a waterfall or two! Yes, "majestic" is the word for these landscapes!